Saturday 19th January - Grounded! Sorry, the weather is pants - there'll be no flying today. See you all at the AGM this evening. Congrats to John McWilliam for his 1000k and Also Andy Smith who completed his 1st on the same day..I've just spoken to Andy about the day and he and others have said it was the best day they had ever flown on.. Member John McWilliam gets fed up with the English weather in the winter so heads off to the Gliding Club of Victoria, at Benalla in Australia for the winter. He had a particularly good flight on Friday. John said "With Bob Nicholls for a 1,000km tour of the outback with full cabin service, sort of 'Meals on Wings'. Took off at 1055 for a 4,000ft tow. Passed through the inversion at 3,000ft, forecast but mildly disappointing, and set off from Benalla at at 60knots to conserve precious height. Got some modest thermals at and beyond the Chesneys but to our dismay found a 20 knot headwind pushing us back strongly. Spotted clouds way higher than us to the east so turned to connect and they took us up enough to get across the Murray. We were now 1hr-25mins into the flight and had only done 70km, far far below the speed you want to start any 1000km flight but we pressed on. Once at height and under decent Cu progress improved, though never as fast as we wanted because the headwind increased to 25 knots and the climbs, while OK, were never ballistic. Proof the climbs were modest came when we met Barry Ferris's DG808 tolerating a weak thermal at Hillston, though we pressed after seeing the number 3 on the vario average dial. At that point we had Sydney far away abeam to starboard - hard to believe but a look at a big map afterwards show that remarkable fact. We reached 500k out at 1600hrs with an average speed so far of 118kph. We had hoped the 25 knots headwind would improve that to hurry us home but the wind had now fallen to 3 knots and we turned agreeing that we would if need be happily lob in anywhere with an airfield and hotel! 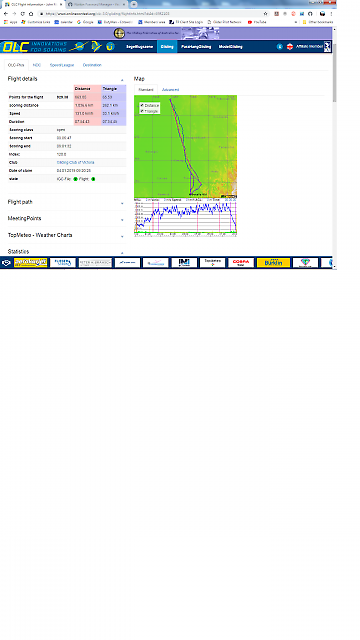 Cloud streets were short and climbs never guaranteed but our average speed clicked up nicely and after a while the wind increased to boost it to show near 190kph sixty minute speeds. In fact on that leg we averaged 179kph on the OLC 2 1/2 hours Speed Comp, the fastest of the day in All Australia & Oceana and fourth in the World behind three out of Worcester GC in South Africa running huge long ridges at low level. As we neared Benalla it seemed possible to do 1100km but the Ovens Valley was all blue sink and we lost so much height we were glad to get back into good air west of the Warbies. There we could have grovelled up to 10,000feet again but that was beneath our dignity, and our ladies had organised meals in the club. Anyway I had by now eaten the last of the food, some grapes I luckily remembered, causing Bob to suggest I should provide a printed menu for him in the food store back there, so having achieved our aim we headed on down for a much needed shower and supper. What an amazing day at Benalla!! The honours for first flight of the new year went to Robin Birch, test flying the new (to us) K8 - an aircraft older than any of us on airfield. He managed to get it down in one piece and several others tried it out. The rest of us enjoyed aerotowing the K21 behind the newly uprated Euro Fox. Here's hoping for a great soaring year. 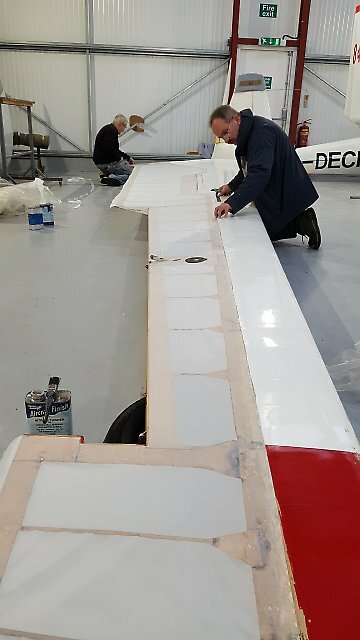 Here is K13 FWB, well the starboard wing anyway, showing Fraser and Gerry attaching fabric to the refurbished wooden structure. We hope to have FWB back in time for soaring in the summer. We were more hopeful of being able to fly today, but the persistent low stratus made this impossible so we cancelled flying at midday. We used the morning to DI the cables and run through the Winter Refresher presentation. 11.15 Defeated by low cloud, flying for the day is cancelled.